Cordillera Blanca is one of the best known and also most beautiful mountain range in Peru in Ancash region. It is covered by snow all year long – hence the name, and yearlong it also attracts passionate outdoor and nature lovers. The glaciers lying under the peaks of Cordillera Blanca gave origin to numerous mountain lakes of different colors and size and these are truly the best places to hike to. Some of them are famous with turquoise blue color - yes, I'm talking about Laguna 69, while others are less known, but not less beautiful. We've spent 3 weeks in Huaraz and Caraz, cities which make the best starting points for hikes to the Lagunas of Cordillera Blanca and visited many of them. Read about all the Lagunas in the Ancash region we visited, how to get there, and which are the best to enjoy without a tourist crowd. The hike leads through small villages and the path is not marked at all, and as we were chatting and not checking the GPS all the time, soon we’ve found out we’ve left the track. Being adventurous as we are, we’ve simply left the path as well and continued through grassy hills and bushes to re-join the track a bit higher. And by doing this, we could really enjoy the beautiful pure nature of this place and even chat with some local people on the way up, who didn’t mind at all that we were trespassing and kindly directed us to the right path. Read more detailed instructions for hiking to Laguna Wilcacocha. Maybe Laguna Wilcacocha isn’t the most beautiful one you can hike to near Huaraz, but it has one thing that the others don’t – absolutely amazing view at the Cordillera Blanca mountains! The lake itself is more of a puddle, though supposedly there are some precious birds living there. But even though we haven’t seen the birds, we saw cows, sheep and alpacas, and were even lucky enough to meet an old lady knitting woollen caps. We’ve immediately bought one - it still smelled as an alpaca and was full of hay. 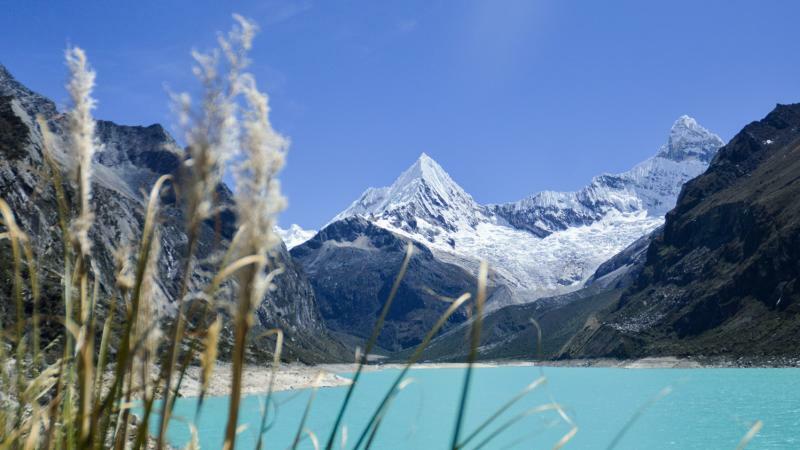 When planning hiking in Cordillera Blanca, Laguna Churup should be on everybody's list. It lies at the altitude of 4450 m and only 20 km from Huaraz, which makes it a perfect starting point. For me, Laguna Churup is the most beautiful one in Cordillera Blanca and the one we’ve enjoyed the most. Getting to there though is not that easy. If you don’t have a car and want an early start, the best option is trying to hire a taxi to get there. There are also organized tours, but they all arrive at the same time making the place quite crowded. We’ve arrived before 7 a.m. to get an early start and to avoid the afternoon rain. Beside us, there was just a young Swiss couple at the parking lot in their camper van, so we knew we would have at least couple of hours alone at the top. The first part of the hike elevates on a nice marked path to two lookout points, from which is a great view at surrounding mountains, mostly mountain Churup – that though is later covered in clouds, especially in the rainy season. After hour and half, the terrain started to be rocky and included some climbing secured by ropes and after another 40 minutes we’ve reached the shores of the Laguna Churup. The view was absolutely breath-taking with mirror like green water reflecting the mountains above the lake. The Swiss couple which arrived just few minutes before of us was even brave enough to jump into the freezing cold water – unlike me, who always just talks about it… Instead, we’ve prolonged the hike to a small lagoon above the Laguna Churup and I’m very happy we did. Having an amazing view at the lake from the other side, we needed just another hour to arrive to a beautiful turquoise blue lagunita Churupita with majestic Churup rising above it – unfortunately, at this point completely covered in clouds. On the way back down, we’ve seen more and more people coming to admire the beauty of Laguna Churup, so we’ve again realized how lucky we are having an option of an early start with our car. Laguna 69 is the insta-famous turquoise blue lake, which is everyday occupied by number of people. This was also a reason why I was considering if I even want to hike there, but why should I avoid places just because they are famous? So we headed on the road having a great company of lovely Canadian girl we’ve met in our hostel the day before. We haven’t picked the best weather though as the sky was cloudy since the morning promising some rain. And it was raining, and it was hard. If you think some hikes are easy just because many people go there, you are wrong, just like I was. Laguna 69 lies at an altitude of 4700 m so getting there is really demanding. The hike though leads through a really nice area full of waterfalls and interesting plants, there are even some small houses made of rocks on the way up. There are many agencies in Huaraz organizing trips to Laguna 69, but as it lies nearby a local road with public transport, it is possible to do it also on your own. The hike starts by the road on a nice grassy terrain making you think it’s gonna be really easy, but then it starts to rise. After an hour and half we’ve arrived to the top of the first hill, thinking that’s it, but after another 30 minutes of fairly narrow terrain, when I was impatiently waiting for the lake to appear, the path started rising again, leaving me completely without breath. Eventually we arrived to the top after another hour, but it started raining so much, that we quickly went down again – the toll for traveling in Peru in the rainy season. Laguna Paron is the biggest lake in Cordillera Blanca and also another massively visited one, mostly because you can easily get there by car. Yes, right to the shores of the lake. But no worries, we still did some hiking around it. The thing about Laguna Paron is, that the road is really bad and we were too afraid to come there by our city car, so we’ve rented a taxi and paid him to wait for us few hours. And because of that we had a bit limited options and had to decide, whether we will be hiking to the small lagoon at the other side of Laguna Paron, or to the view point above it. Well, those of you who know us already know, that we’ve decided to do it all. So after admiring the view of Laguna Paron with numerous colourful boats and the Nevado Piramide behind it, we set on the hike towards Laguna Artesancocha, a supposedly easy 2hour hike. Though it lies at the altitude of 4200 m, it really was an easy hike. The path leads on the left shores of the lake, not rising much and the only obstacles were a few river streams we had to jump over, and 100m rise in the end. Now, let me tell you the truth – the first view of Laguna Artesancocha was a bit underwhelming, we all agreed on it. After seeing the blue waters of Laguna Paron and the green waters of Laguna Churup, this one was just, blah… But the weather was amazing, sun and perfectly blue sky - did you know that the higher you are, the darker the sky gets? So we were just sitting there, chatting about all possible and impossible things (including the blue sky) and enjoying the moments. Of course, that meant we barely made it back on time and didn’t make it to the view point anymore. But at the time we made it back to Laguna Paron, it got filled by hundreds of tourists, so we really didn’t mind that much. You remember how I told you, that we’ve chosen the worse day to hike to Laguna 69 because of the weather? Well Laguna Llanganuco lies on the way there and seeing how foggy it was as we were approaching it was really disappointing. I was even considering to turn around and come back the next day, but I was really happy that we didn’t do it. Because we usually start very early when we go hiking, we were lucky to arrive to Laguna Llanganuco when it was still covered by the morning mist, and damn what a beauty that was! The fog above the lake and the sun shining through it created a beautiful light show. I was happy like a lactose-intolerant kid with bucket of vegan ice-cream, running around and snapping photos. And this magic disappeared within 15 minutes, so we were really lucky to catch it. But then there was still the green lake with the reflexion and the boats, creating the perfect atmosphere for more and more photos… This lake lies just next to the road, so we didn’t do any hiking here, only walked around a bit as we were rushing towards Laguna 69 to avoid the rain. Yes, I’ve already told you about Laguna 69 and nope, I didn’t mix up the numbers. Laguna 513 is almost unknown lake, and although it looks pretty much the same as Laguna 69, that’s just the fog above it at the time we’ve visited. Imagine there is a beautiful mountain above the blue lake, completely different than the one rising above Laguna 69, which you also cannot see on my photos… Anyway, we hiked to Laguna 513 twice – first attempt was when we were moving from Huaraz to Caraz, we came too late, hiked 2 hours and then turned around in the middle of the hike when we saw the black clouds accumulating in the direction we were heading… So we came back the next day. And it was worth it. Hike to Laguna 513 is one of the best ones in Cordillera Blanca, though without a car it might be harder to get there. The best option would be to arrive to Carhuaz by bus and then finding a moto taxi to drive you up to the starting point… First, the path has lead through a grassy terrain with lots of cows, then we arrived to river crossing where a rocky terrain and rapid elevation gain started. After another hour we arrived to a small lower lagoon, which was a pleasant surprise. Laguna Yanahuanca has a beautiful green color and was a perfect spot for having a snack before continuing up. At this point, the mountains were slowly getting covered by clouds and we knew, we had to hurry if we didn’t want get caught in the rain. Because we had some extra time in the town Caraz (one hour from Huaraz), and we still didn’t have enough of hiking to lagunas (well, me, Primoz would tell you differently), we headed to Laguna Pampacocha and Mirador. These two lakes are completely different from all the other mountain lakes, though the setting is a bit similar to Laguna Wilcacocha. Willi, the co-owner of Yoli's house (get your 15$ coupon here) where we were staying in Caraz, told us about this hike as a local secret, and it really is something special. We took a colectivo bus to the starting point at Tsacsa town and from there set on foot back to Caraz, with Laguna Pampacocha and Mirador on the way. There is only a small hiking uphill at the start including a short walk on an old inca trail, but after approximately one hour, the trail starts to descent until it reaches Laguna Pampacocha and eventually Caraz. The truth is, that Laguna Pampacocha really is just a small puddle, Mirador being even smaller one, but the setting around is amazing and gave us a great idea about what the life is like around there. Horses, dogs and cows running freely around, people working on the fields with hundreds of years old tools and everybody being quite happy to see some gringos coming to have a look at how they live. We even got invited for a drink by two men sitting by the road merrily chatting in quechua and drinking chicha, and one small child of a family working on the field was so happy to see us, he told us hola like hundred times. Cordillera Blanca mountain range in Peru is home of numerous mountain lakes suitable for one day hikes, but travellers usually come here to do a multiple days treks such us Santa Cruz trek or trekking through Huayhuash mountain range near Huaraz. Hikes in Peru though are more complicated, if you come in a rainy season just like we did and the weather is not good enough for doing a multiple days trekking. One-day laguna hikes are great alternative, because even in the rainy season, it is usually nice weather in the morning and it only starts raining in the afternoon. Check the map with all laguna hikes from this article and choose the one, you will do on your next hiking trip to Cordillera Blanca in Peru.